In the pantheon of significant Indianapolis families, the Lacy family deserves a place of distinction. This book is a corporate history about a family-owned business. Across the generations, various members of the family put in place all the processes, procedures and safeguards to make it a viable institution that, while family owned, is not family dependent. The story begins in 1911, when H. J. Sr. incorporated the U.S. Corrugated-Fibre Box Company in his adopted hometown of Indianapolis. One hundred years later, having been headed by family members Howard J. Lacy II, Edna Balz Lacy (his widow), and their son, Andre B. Lacy, the company still thrives. Keen business acumen and an ability to discern the signs of the times have been the family’s hallmarks. The original business was sold in 1984, and subsequently the organization morphed into a closely-held investment/operating company known as Lacy Diversified Industries (LDI, Ltd.), specializing in “value-added distribution businesses,” headquartered on the Circle in downtown Indianapolis. 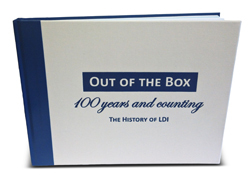 And a fourth generation is preparing in the wings for its opportunity at leadership, thus demonstrating that LDI is “an institution” not reliant on any one individual for its life and growth. In addition to their contributions to the ongoing economy of their home town, the Lacy family has been part of the civic and philanthropic leadership of Indianapolis over the past century. H.J. II served two terms as chairman of the Chamber of Commerce. Edna, with tenacity, perspicacity and a large dose of common sense, continued to fill her husband’s role after H.J. II passed away in 1959, serving on many boards until her death in 1991. Edna, a dynamic individual with a spunky spirit, hearty laugh and great sense of humor, threw some superb parties at Lacywood, the family’s home, along the way and cut a wide swath through Indianapolis society. She was a strong advocate for the rightful place of women in board rooms and in positions of civic leadership. When her son Stanley K. (“Lucky”) died in a car accident, she established and funded a community leadership series in his name, now in its 36th year and overseen by her daughter, Margot Lacy Eccles, an LDI executive and active community leader who has devoted her talents and philanthropy to many educational, arts and cultural institutions. Edna’s son, Andre, joined her in running the family business immediately upon his graduation from college. An astute business man but also extraordinarily civic minded, Andre became prominent in many different areas of the city’s life and succeeded his mother as LDI chairman. Concerned about the quality of public education, he ran for and was elected to the Indianapolis School Board where he served as president. He helped found CLASS – Community Leaders Allied for Superior Schools. He has been an active member of the Young Presidents’ Organization and held leadership positions on various Indianapolis boards, including chairmanship of the United Way of Central Indiana, the 500 Festival Associates and the Indiana State Fair Commission. Respected, intelligent, generous, he has been an integral part of the city’s leadership for decades. The legacy of the Lacy family consists of many intangibles as well as the obvious visible ones. An entrepreneurial spirit; a strong commitment to enhancing the growth and quality of life in their hometown; an understanding that with privilege goes responsibility; a discipline of continuous learning and improvement; a willingness to embrace change as dictated by the market and roll with the historical punch instead of standing pat; an adherence to high standards of honesty and integrity; a generosity in support of worthy causes – all these qualities, these values, deserve a city’s praise and gratitude.